Thank you to the Huffington Post to putting together a moving video documenting Amber and Ali's petition delivery to the Clinton and Trump Campaign HQ in New York City. With over 3.2 million views (and counting!) the support of these incredible women, their families and supporters, and for national paid family leave policy continues to grow. Share with your friends and networks! 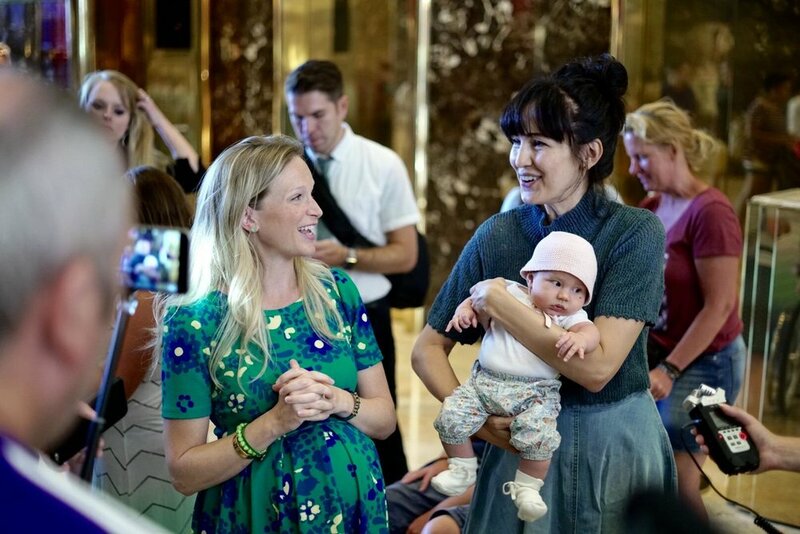 On August 22, PLUS Action Fund was honored to support Amber, Ali, and their families and friends in delivering their Change.org petition with over 135K signatures to the Clinton and Trump campaign HQs in New York City, asking both Presidential candidates to commit to acting on paid family leave in their first 100 days in office. You may have seen in USAToday, Slate Magazine or Refinery29, the story of Amber Scorah and Ali Dodd -- two incredible mothers, one a Republican from Oklahoma, one a liberal from Brooklyn -- who faced tragedy last year when they lost their newborn babies after not having the paid parental leave they needed. PL+US is proud to be working with Amber and Ali in their Change.org campaign calling on the Presidential candidates to commit to acting for paid family leave national policy in their first 100 days. The support for their call to action has been incredible -- and it’s working -- with over 70K signatures on their Change.org petition and climbing every day! In May 2016 these incredible moms appeared on Fox News' The Kelly File to discuss their experiences and call on all the Presidential candidates to make paid family leave a priority in their first 100 days in office. Megyn Kelly's piece with Amber and Ali was sensitive, thoughtful and moving. It set the tone for powerful, bipartisan action on paid family leave. As Ali said, "Look at paid leave from a family values standpoint. You are going to make a family stronger and safer" . Read Ali's Fox News OpEd calling for action on #paidleave in the US. Share the video of Amber and Ali's Interview with Megyn Kelly.